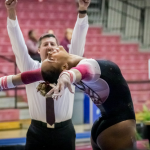 We’ll be watching individual performances more than the team competition in this meet: While Alaska did come close to defeating the Aggies two weeks ago in Davis, it took a lot of counted errors to drag the meet into contentious territory. That said, Alaska is having its best season in years—it recorded its all-time best January score several times over, and its season high is No. 6 in program history—and senior night is a great opportunity for another high score. Meanwhile, UC Davis is dominating the MPSF and should be able to climb even higher with sophomore Kyla Kessler’s return to the all around. It’s not hurting for good road scores at this point, but if the Aggies can keep their trajectory, they’ll be in the fight for a regionals spot. We’re waming up VERY extensively. First vault at 3:11. The stream is extremely jittery and there’s no audio, so I’ll do the best I can on names and skill IDs – I’m very comfortable with both these teams so we should be okay – but forgive me if there mistakes. NELSON – UAA: Yurchenko layout, a touch piked, hop in place. Good start. ITO – UCD: Toe to Maloney, bit of leg sep on the backswing, misses a handstand on HB and another on her bail. Double lay hollow, stuck-ish. FANDRICH – UAA: Another layout, two midsize steps back. HEBERT – UCD: Short on a handstand, blind to pike Jaeger solid, half turn to toe on front pike with a step forward. Nice. GREEN – UAA: Handspring front, medium step forward. She’s great at controlling that vault. LANDESS – UCD: Way short on first handstand, toe on archy to Gienger to overshoot with a bit of leg sep after the release. Double Arabian really good with a hop back. MARVEL – UAA: Love this vault. Tsuk tuck full with a single step back, tons of amplitude. LIDDLE – UCD: Gienger with major leg sep on the catch, clear hip to bail, blind full double back stuck. Nice! SCALAPINO – UAA: Stream is so jittery that I couldn’t see much action but she usually does a handspring front. 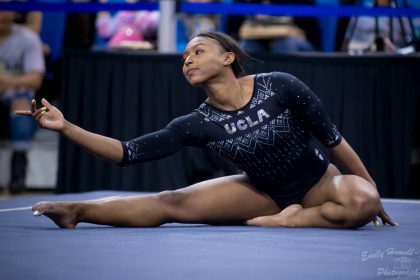 KESSLER – UCD: Full turn to Gienger, bail, short on a handstand by just a little, way short on her double lay and falls forward onto her hands. Ouch. Especially coming off an ankle issue. FOX – UAA: Great Yurchenko arabian, quick small step back. SUZUKI – UCD: Blind to pike Jaeger, really nice, Pak is beautiful. Half turn on the LB with a bit of a back arch but keeps it moving, blind full double back stuck. Fantastic! Alaska has a vault exhibition now, which is AMAZING from a team that was putting up five for half of January. Pretty sure this is Sofie Riley, who’s been injured. Yurchenko layout, touch of knees but more laid out than the counted pair and a great landing. Yay!! I think UCD’s bars exhibition is Cammi Johnson. Gorgeous Gienger, way short on bail. Tentative handstands throughout, blind full double back with a little hop. Alaska’s vault rotation was okay, pretty in line with what we’ve seen in its better meets so far in 2019. Davis had some handstand issues but did really well minimizing them and recovering from the fall from Kessler. Fun story, Alaska had to reorder this beautiful new leotard because washing it screwed up the color. Glad they’ve got them back now! We missed the first vaulter, they didn’t take away the team logo graphic in time. I think it was Ito. FOX – UAA: Full turn to bail to toe shoot, great! Had to muscle up the cast there a bit but no biggie. Double lay STUCK. Probably the best bars I’ve seen her do all year. YEKTAPARAST – UCD: Tsuk tuck full, little hop in place. She is on FIRE her senior season, that was great. MANCARI – UAA: Lol I can see Tere Alonso smirking at the camera in the background. Clear hip to Gienger to overshoot, leg sep on the Gienger catch but okay, hitting handstands, slightly slow on a blind full, double back and I think that was stuck again!! CUNNINGHAM – UCD: Good to see her back in lineups. Think she hurt a toe or something a few weeks back. Big full, big step back. Very useful vault. GREEN – UAA: Giant to blind to Jaeger to overshoot, huge and really nice. 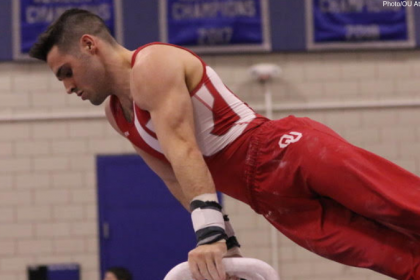 These release combos aren’t easy but they’re a great way for a lower ranked team to reduce deductions on bars, since their routines are shorter and have less cast handstands. Blind change double front stuck, holy crap! JOHNSON – UCD: Nice full with a step back, smaller than Cunningham’s but also not as much amplitude on the vault. NELSON – UAA: Blind is late, pike Jaeger to overshoot holy CRAP. She caught that on her wrist and just kept going, unless my eyes are failing me. Blind full double back, STUCK AGAIN. Her handstands weren’t perfect there but what a recovery. 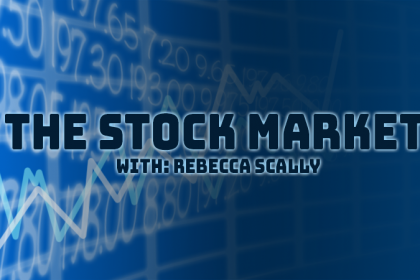 HEBERT – UCD: Really nice full, a little piked down but really controlled. Don’t remember the exact landing situation but it was solid. HYDERALLY – UAA: Toe on to Pak, blind… has to haul it over the bar… to gorgeous Jaeger, half turn to immediate double back with a tiny step. Really nice. LANDESS – UCD: Tsuk tuck one and a half, gets her heels down but sits it immediately. I’ve seen her train that but not certain she’s competed it before. Bummer she couldn’t get there today but it’s a great 10.0 when it happens. MILLER – UAA: Blind to Jaeger, lovely, hitting the handstands, great bail. This looks effortless today. Blind full double back, just pulls her heels together, YES. Knapp in the exo for UAA! Love the Church. Handstands not quite there but she’s building back up as she goes after a preseason injury, last I saw this she was doing a timer dismount. Got a real one today, double front is just over and she rebounds onto her hands but that’s very close to happening. Whoa. Waiting for the livescore to update, but if those scores are legit Alaska just set a program record on bars by like a quarter of a point. UCD is okay not great today. The trip to Anchorage is tough for everyone, not super shocked. FOX – UAA: Hit the triple series bit of knees. Hitch kick switch half, some other stuff, punch front full with a step. AGAH – UCD: Double back underrotated with a step forward. Front lay front full, or maybe the opposite, is good, one and a half front pike and one foot slips but she gets it down behind her. Really good recovery there, could have sat it pretty easily. MANCARI – UAA: Front aerial BHS, incredible confidence. The Seawolves are rolling now. Switch double stag, awkward with a step, cat leap front aerial. Love seeing AC Alina Cartwright filming during meets, she makes awesome promo videos. Gainer full pikey but stuck. Nice. LANDESS – UCD: Double pike directly from round off, really good. Camera keeps forgetting to follow her. I like watching Cortney Cunningham dance too, but come on. Double back a touch under, step forward, switch to wolf full split full. One and a half front lay is beautiful. 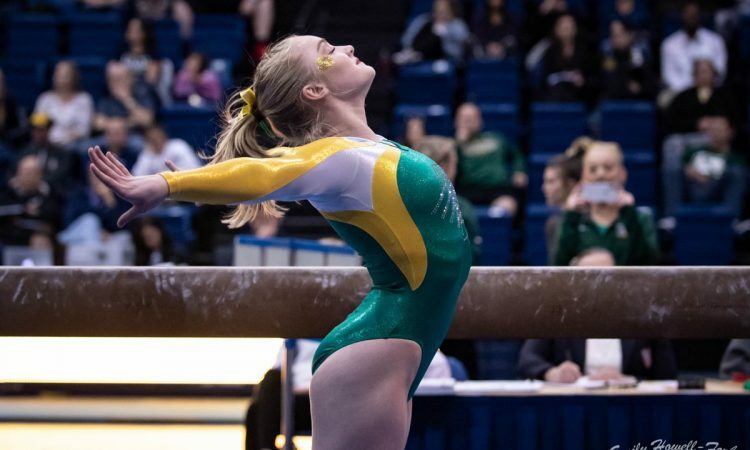 MARVEL – UAA: Love this one, she’s an in state gymnast who didn’t get much in the way of JO scores but she’s BEAUTIFUL and currently keeping the vault lineup alive. Press handstand mount, full turn, leap series, BHS LOSO a little tentative but pulls it in line with her arms. Side aerial, gainer full dismount stuck-ish (we couldn’t see her feet). SUZUKI – UCD: More direct from round off tumbling. Double pike is short, yeah that’s why most people don’t do that. Did she just try and do a Ferrari or was it just a sketchy tj1/2? One and a half punch front is nice. DECIOUS – UAA: YAS so glad she’s in lineup, they’ve got five locked in and have been playing with the sixth and I think Decious is the right choice. She’s a Gold Medal creation (the Amanda Borden one) and gorgeous. I forgot to write about her skills but she hit them. Punch front full, leans forward but hangs onto it, maybe just a toe shift. THANK YOU. LIDDLE – UCD: Bit deep on her two and a half twist but it’s very pretty. Double back YEAH. Could have stuck that, elective lunge, it’s great. Switch ring tj1/2, front lay front full is great. Alaska is winning right now soooo. ALONSO – UAA: She always reminds me of an elf and I don’t know why because she’s not even that short. Switch ring nailed, kickover front, BHS LOSO and off ugh 🙁 Something to double stag, full turn, BHS 3/2 twist with a step forward. It’s okay, it was still beautiful. YEKTAPARAST – UCD: Probably the best smile in the NCAA. Lands twisting on her front double full, front lay Barani LOSO, love that pass. Switch side Popa or something like that, double back a touch under with a step forward. HYDERALLY – UAA: Front aerial front aerial, not the quickest I’ve seen it but quick enough that I doubt she’s at risk. Switch straddle quarter, split back tuck beautiful. Tons of drama in the choreo, this routine is just so beautiful, gainer pike off to one side as usual but stuck. YES. HEBERT – UCD: Double pike, kinda tucks the second salto and scoots back out of it, that’s not her style. Something front lay, one foot slides but she’s fine, dead stick on the closing double back. She does that a lot and it’s always legendary. Nelson in the beam exo for UAA, I’ve been wondering where she is! Front to back series, split quarter split half was that….? with a check. Cat leap front aerial, another check, gainer full and swims a bit. That routine’s very pretty, good to see it’s still happening. Speaking of routines I’m glad are happening!! Pretty sure this is Liah Bosworth in the floor exo for Davis. She was supposed to be a very big deal for the Aggies and I’m not 100% sure why she hasn’t been so far but this routine looks great. That was definitely a Ferrari. You guys. Alaska could get a program record. I would CRY. GREEN – UAA: Double back, scoots a bit, front lay to Rudi… I think. Stream is still quite jittery, doing my best. I think her leap series is switch side wolf full Popa… stumbles forward on her last landing and puts her hand down. Pressure now. LANDESS – UCD: Nice leaps! Triple series, bounces right off the end of the beam, WHOOPSIE. Full turn, tuck arabian dismount forward onto her hands… what in the world? I think she bailed on a one and a half. Strange and a bummer. DECIOUS – UAA: What a moment for the freshman. Big step out of her Rudi, her choreo is gorgeous and lyrical, they posted a video of the whole team doing it earlier this week. Front lay front full I think, touch of form but solid, outside attitude turn in her choreo ugh those are so fun. Switch half sissone, one and a half front lay great. NICE recovery. MANCARI – UAA: She’s so dramatic, I miss having music. Gorgeous on the front double full. I missed all the middle stuff because I was too busy being heart eyes to type. Rudi to close is solid. LIDDLE – UCD: Off on her leap series I think…? And then my stream dropped out. COME BACK THIS IS IMPORTANT. MILLER – UAA: Okay we’re back. Double back, really nice, she’s crazy powerful and her performance is getting better through the season. Really milking the landings. Rudi I think, switch ring wolf full a little messy, one and a half front lay… I worried that was coming in short but she got it. Really really good. YEKTAPARAST – UCD: Definitely someone who can handle following a fall. Acro series really nice, switch half a little short, lots of pretty stuff, my attention span is failing on me because I’m EXCITED. Gainer full flung out with a step. FOX – UAA: Front lay front Rudi really good, double pike a few quick steps back… ugh, it’s going to be really borderline on the PR but still a 194 is nuts and that’s what we’re looking at. HEBERT – UCD: Triple series, bit of legs but really nice, full turn, split switch side. One and a half twist step forward. Solid hit, at least the Aggies can drop the disaster from Landess. Winter Osborne in the exo for Alaska. The cutest possible routine. JUST short of a PR but what a meet for the Seawolves, who scored their second 194 ever and beat Davis for the first time since 2004!! The Aggies weren’t themselves at all today. I’m not worried, they’ll be back, but hoping that Kessler’s ankles are okay after that stinger on her bars dismount and that Landess was just having an off day.